They drove over 19,000 miles in an Austin Healey 3000 Mark II and visited 14 different countries all in 80 days!!!! When Peter first asked Ann if she would like to drive around the world in this little car, her response was "You must be joking?" BUT.......Since reading the book on the 1907 PEKING to PARIS RAID, her husband Peter had this dream to emulate these intrepid motorists. Nothing was going to stop him. In 1982 an attempt was made to re-run the race but the Sino-Russian border remained firmly closed. 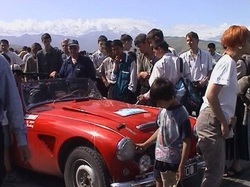 With the end of the cold war, the Classic Rally Association led by Philip Young, organised an event in 1997 to celebrate the 90th anniversary of this race. This was a huge success but Peter missed the boat on this one. The CRA decided to celebrate the Millennium with a repeat of the 'Peking to Paris' race, but running in reverse. In tandem would be a marathon 'Around the World in 80 Days', something that had never been attempted before, a timed lap of the globe by classic cars. Unfortunately, Peter saw an article about this Project and over breakfast one morning said: "What do you think? Shall we go for it, before we are too old? We could do the London to Peking part." Well, always being one to rise to a challenge, Ann replied without thinking: " WHY STOP THERE? If you really want to do it , why not go the whole hog". Due to her inability to keep her mouth shut! six months later they were well on with the preparations for their epic adventure. 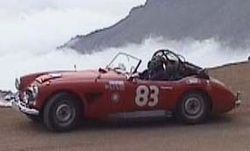 Peter had owned an Austin Healey 3000 MkII for thirty-one years so there was no contest as to what make of car they would drive, however he was loathe to subject his pride and joy to the rigeurs of the Taklamakan desert in China and other such dangerous places. 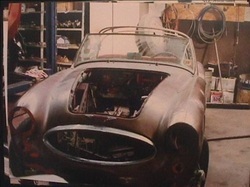 In Autumn 1998 Peter purchased a Left hand drive 1962 Austin Healey 3000 MkII from America. This arrived in January and was restored and rebuilt with various modifications to make it reliable for long distance rallying. Although called the Big Healey there is minimum space for an 80 day adventure. However 18 months down the line they were ready for the start at Tower Bridge, London. Sir Stirling Moss flagged the cars away at the start of the 2000 Millennium Motor Challenge - AROUND THE WORLD IN 80 DAYS. Every young man loves a sports car!